Today saw our plucky Eggsplorers head off on their journey to the edge of space. The MARSBalloon project is a Thales UK funded venture, run by young space engineers from Thales Alenia Space UK, that will test student ideas for technologies that could one day be destined for Mars. The aim is to test anything that humans or robots will be doing on Mars in the future. They will launch 100 experiment capsules on high altitude balloons 30km up into the Earth’s atmosphere, a place where conditions of gas pressure, temperature and radiation are very similar to the surface of Mars. 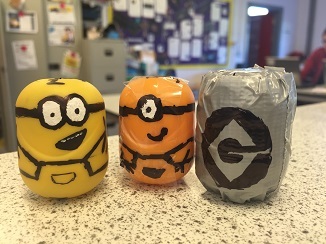 Students from the 6th form and Astronomy Club were asked for ideas for experiments to include in our 3 spaces which are the middles of Kinder Eggs. The experiments had to fit inside the plastic capsules and weigh less than 40 grams. Our 3 capsules will carry a total of 5 experiments. Our primary capsule has on-board some photographic paper to see if we can capture cosmic rays and a selection of rubber bands. The rubber bands will be tested after the flight to see if the elasticity has altered which will be important for the choice of materials on a real Mars mission. Dave (our second capsule) is carrying marshmallows and gummi bears. Will the journey alter the amount of water they will take in through osmosis? Something that might be important if humans visit Mars. The final experiment is b eing handled by Bob. He is carrying the most important experiment of all for the UK Space agency to consider before sending anybody to Mars. Bob is carrying a tea bag to see if the trip will affect the good old British cuppa! Our experiments are now on the way to Bristol and will be launched soon. Meanwhile we have an identical set of capsules safely stored at room temperature so that experiments can be compared with a true baseline when they are returned to Earth later.